2000KG ATM Braked Trailer Solid Heavy Duty Trailer. 14″ Light Commerical Tyres. Upgraded 7 Leaf Rocker Roller Suspension. Dual Axle Solid 50mm Round. 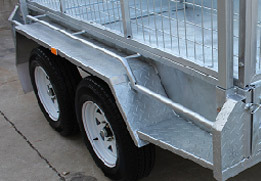 Welded Tie down rails Also features our company branded mudflaps on trailer. Long Drawbar for easy maneuverability. Splently of room for a tool box and spare wheel. 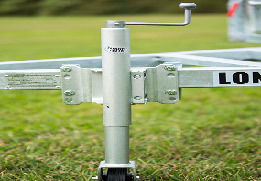 8″ Heavy Duty Swing Up Jockey Wheel. Also features quick release to pivot & lock into position.